Chulu East Peak (6,584m) is comparatively a smaller Peak for Climbing lies south east of Chulu West. The Peak Chulu East provides breathtaking views of the mountains like Annapurna II, III and IV, Gangapurna, Glacier Dome, Dhaulagiri, Tilicho Peak and Mt. Manaslu. 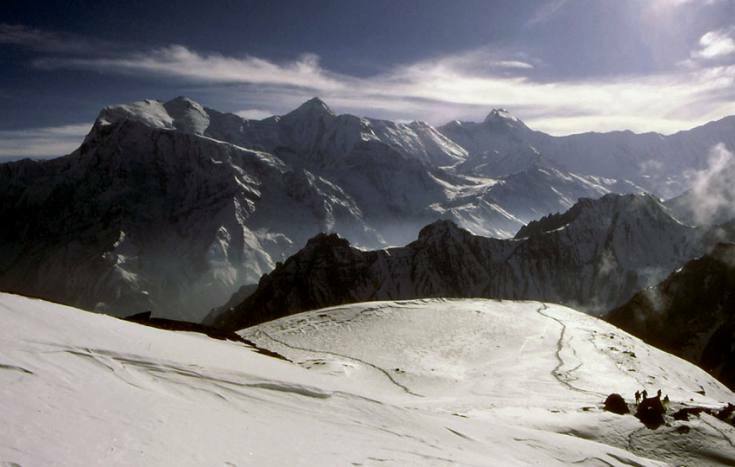 Chulu East Peak was first ascended in 1955 by a German expedition via the northeast ridge. It forms an integral part of Manang Himal combining both Chulu East and Chulu West Peaks, which ultimatelycombined with Damodar Himal. Chulu East climbing is technically difficult for the new climbers. north of Manang situated off the main trail to Thorong La pass 5416m. Indeed some of the best views of this peak can be had from that pass. North-West Ridge: Go beyond the hut following the yak pastures and walk up a ridge which leads into a hidden valley where it is possible to find a good site for base camp. From this camp , ascend steep scree slopes to a col 4,900/16,076 feet), on a subsidiary ridge that leads down from the main ridge. To the north of the col ascendsnow slope for 200 meters to the base of a band of rock at an altitude of 5,100 meters and thesite for a possible high camp. Climb the rock band with some difficulty to the north-west shoulder of Chulu west 5450 meters/17,880 feets, where another camp can be established or alter-native a camp can be placed on a snow plateau above 5,530 meters/18,143 feets. On the first ascent and several subsequent ascents rope was fixed on the rock band. From the plateau continue up the progressively narrowing ridge to the summit 6,250 meters /20,505 feets.Descend by the same route. All land transportation as required in trekking and pick up from airport and drop to the airport in end. National park permits and Trekking permits. Peak Climbing Fees and permit. Food and accommodation for guide and a support crews ,their salary and insurance. Emergency rescue service for you and Nepali staffs. Your personal wedges and bar bills. All kind of bottle drinks. Tips to Nepali support crews. Day 01Arrival in Kathmandu and transfer to the hotel. Day 02Details information regarding about the trip for basic preparation and make a permit. Day 03Drive to Bhulbhule to Ngadi 940m. Day 04Ngadi - Jagat 1300 m.
Day 05Jagat- Taal 1707 m.
Day 06Tal - Bagar Chhap 2160 m.
Day 07Bagar Chhap - Chame 2670 m.
Day 08Chame - Hongde 3250 m.
Day 09Hongde - Ngawal Village 3600 m.
Day 10Ngawal - Base Camp 5140m. Day 12Climb to High Camp 5600m. Day 15Back to Base Camp. Day 16Base Camp - Manang 3540 m.
Day 17Manang - Churi Lattar 4200 m.
Day 18Churi Lattar - Thorang Phedi 4450 m.
Day 19Cross over the Thorang-La 5416 m - Muktinath 3750 m.
Day 23Sightseeing day in Kathmandu. Seat Harness, Jumar, Helmet, Altimeter, Ice Axe, Crampons, Ice-Crew, Gaiter, Locked and unlocked Carabiner, Climbing boots, Pocket knife, Head lamp, Mattresses, Rope, Rain gear, Ice hammer, Deadmen, Halmet (Crash hat),Sleeping bag. Chulu west peak trip can be organized tented camp ( camping) only also, if you are not interested to do combine service tea- house + camping (tented camp).If above itinerary doesn't address your plan,please feel free to enquire further. Our team of Package developer would develop the package as per your wish. Happy Journey and Welcome to the land of Himalayas.